Just because you grow older doesn't mean you have to grow up! Comedy superstars Adam Sandler, Kevin James, Chris Rock, David Spade and Rob Schneider are at their hilarious and outrageous best playing childhood friends who reunite one holiday weekend to relive the good old days. It doesn't matter that these five guys are now respectable businessmen, husbands and fathers. Once they get back together, nothing is going to stop these kids-at-heart from having the time of their adult lives. 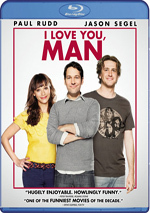 From the people who brought you Click, comes this hilarious and heartwarming film that proves men will be boys. $40.506 million on 3534 screens. 15 years after Billy Madison showed that he could star in successful movies, Adam Sandler continues to deliver box office gold. His latest project: 2010’s Grown Ups, a $161 million hit. A flashback to 1978 shows a group of pre-teens who win their local basketball tournament. When we come back to present day, we learn that their leader “Coach Buzzer” (Blake Clark) has died, and all his former pupils reunite for his funeral. This group includes big-shot Hollywood agent Lenny Feder (Adam Sandler), househusband Kurt McKenzie (Chris Rock), local businessman Eric Lamonsoff (Kevin James), single party boy/serial womanizer Marcus Higgins (David Spade) and sensitive New Age guy Rob Hilliard (Rob Schneider). After the service, all of the guys retreat to a lakeside cabin for a long weekend. They bring along their families, a conglomeration that includes Kurt’s nasty, flatulent mother-in-law (Ebony Jo-Ann) and emasculating wife Deanne (Maya Rudolph), Lenny’s fashion designer wife Roxanne (Salma Hayek) and their two spoiled sons (Jake Goldberg and Cameron Boyce), Rob’s radically older wife Gloria (Joyce Van Patten), and Eric’s overprotective wife Sally (Maria Bello). Assorted other kids come along as well, including Eric’s son Bean (Frank and Morgan Gingerich), a child who still gets breast-fed at the age of four. Much of the action simply follows their time together and various family-related subplots. Lenny and company also encounter Dickie Bailey (Colin Quinn) and his cronies, all of whom played on the basketball team that lost back in 1978. They never moved on and remain bitter about their experience, a fact that leads toward a climactic rematch. I’ve formulated a general rule about Sandler movies. Nice Guy Adam – think 50 First Dates or You Don’t Mess With the Zohan - provides fairly amusing, charming movies. Arrogant, jerky Adam – ala Click or I Now Pronounce You Chuck and Larry - produces mean-spirited, unfunny flicks. At the start of Grown Ups, it looks like we’ll get Arrogant, Jerky Adam – has anyone ever played a Hollywood agent as a good guy? After a quick glimpse of nastiness, though, Lenny quickly morphs into a pleasant family man, so it’s clear that this flick will feature Nice Guy Adam, so it should become another of Sandler’s enjoyable efforts. Heck, with so much support talent, how could it possibly flop? I can’t answer that, but I can this: it does flop, and it flops bad. Grown Ups may or may not be the worst Sandler film I’ve ever seen. Actually, it’s probably not the lowest of the low; Sandler’s made some real stinkers, and I suspect that Grown Up seems like the bottom of that barrel just because it’s the one I’ve suffered through the most recently. So it remains up for debate how Grown Ups compares to Sandler’s other dreadful movies, but there’s no question that it’s an atrocity of an extreme nature. Look, I’m not one to bash Sandler for sport. Indeed, I’ve defended the guy over the years. Though he makes it tough some times, Sandler has produced enough funny material to always give me optimism. Which makes the dashed hopes of Grown Ups all the more appalling. That’s a really good word for this movie: “appalling”. There’s also “abominable”, “awful”, “execrable”, “offensive”, “intolerable”… and that’s just words that start with vowels. Once I get to the consonants, I can really let loose! I don’t think I can overstate the awfulness on display here, though. When I saw Grown Ups theatrically, I sighed on a near-constant basis. I found myself so depressed at the crude, unfunny nature of the product on-screen that I could muster no other reaction. Groaning and hoping for death – or at least a fire alarm – were the highlights of the experience. If Grown Ups simply offered comedy that wasn’t to my taste, I might better excuse it. This is certainly the case, as Sandler et al. can’t find a puerile gag that don’t embrace. I understand that this comes with the territory in Sandler-Land. His movies always include more than a modicum of potty humor, but the better ones also throw out clever gags and interesting characters. None of that occurs here. We can debate if Grown Ups is the worst film from summer 2010, but I’m sure it’s the laziest. The flick appears as though Sandler and his buddies rented a cabin for a long weekend, brought along a few actors, and made up the movie as some sort of improv exercise. There’s virtually no plot, and the characters are thinner than an Olsen twin on a hunger strike. The jokes tend to fall into two categories. We find a lot of insults the guys hurl at each other, and we get a lot of poop/fart/gross-out gags. The wisecracks are stale and witless, and even though the movie boasts superb comedic talents like Rock, they’re delivered in such an awkward, “I’m not sure what my line is but I don’t care” manner that any theoretical humor bombs. As for the gross-out stuff, I’ll just say this: if you can’t get enough of farting grandmas, Grown Ups is the movie for you. If the sight of 40-something men peeing in a public pool delights you, go for it. If the notion of a guy making out with an elderly woman tickles you, have a party. Me? I don’t find much witty material in Grown Ups. Early in the film – before its laziness and stupidity became obvious – I chuckled two or three times. Before long, though, all I could do was stare in horror at the dreadful attempts at humor placed before me. And I had to watch the movie again to write this review. Fans of DVDMG – you frickin’ owe me big time! 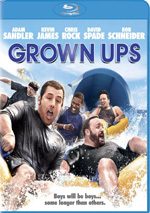 Grown Ups appears in an aspect ratio of approximately 1.85:1 on this Blu-Ray Disc. No issues emerged in this satisfying presentation. I thought the DTS-HD MA 5.1 soundtrack of Grown Ups was unexceptional, though it worked fine for this sort of film. Of course, I didn’t expect a dazzling soundfield from this sort of comedy, and I got exactly what I anticipated. In terms of effects, general ambience ruled the day. Surround usage stayed limited; the back speakers gently fleshed out various settings but did little more than that. We find a smattering of extras here, and these open with an audio commentary from director Dennis Dugan. In his running, screen-specific chat, he discusses the film’s origins and script, sets and locations, cast and performances, stunts, effects, music and a few other topics. I’ve heard a few Dugan commentaries, and they’ve ranged from mediocre to mediocre. Guess what? This one’s pretty darned mediocre. On the positive side, Dugan provides a light, reasonably engaging presence, and he tries hard to keep us entertained. Unfortunately, he just doesn’t have a lot of substantial material to give us. Dugan delivers a decent but unmemorable chat. 10 Outtakes and Deleted Scenes fill a total of 10 minutes, 15 seconds. Most of these expand the roles of the women. The most significant shows Roxanne at a fashion show where she and Lenny discuss the trip to Milan and the detour for the funeral. It was a good cut; it gives Hayek more screen time but makes her look mean and unsympathetic. Speaking of which, we see more of Kurt’s nasty mother-in-law, and we observe that she keeps tabs on him through the sight of a rifle. This is a genuinely tasteless gag, as it strongly implies the mother-in-law plans to shoot Kurt. Next comes a featurette called Laughing Is Contagious. It lasts four minutes, eight seconds and shows goofing around on the set. A few participants tell us how much fun they had during the shoot as we watch their silliness. Snooze. A Gag Reel goes for three minutes, 49 seconds. While it includes some of the usual goofs and giggles, it also provides some alternate lines. That makes it more interesting than most reels of this sort. More unused footage shows up under Riff-O-Rama. The four-minute, 37-second compilation shows the five lead actors as they work through one particular scene. None of the cut lines are funnier than the included ones, but it’s cool to see the actors as they improv in this fashion. A few more featurettes fill out the set. Dennis Dugan: Hands On Director lasts four minutes, 38 seconds and includes comments from Dugan and actors Chris Rock, Salma Hayek, Dan Patrick, David Spade, Maya Rudolph, and Maria Bello. We see Dugan work on the set, and the actors tell us what it’s like to have him as director. Some of the behind the scenes shots are decent, but the piece remains pretty insubstantial. During the six-minute, 46-second Lost Tapes of Norm MacDonald, we get comments from actor MacDonald. He talks about his character – who barely appears in the final flick – and see his deleted footage. Some amusement results, though I’d be interested to know why MacDonald’s work got the boot. The Cast of Grown Ups runs seven minutes, eight seconds and offers remarks from Dugan, Hayek, Spade, Bello, Rock, MacDonald, Rudolph, and actors Rob Schneider and Kevin James. They talk about how wonderful they all are. Other than some footage from the set, it’s a waste of time. Finally, Busey and the Monkey fills three minutes, 24 seconds. It’s actually another deleted scene, as it shows Lenny’s work as Gary Busey’s agent. The scene shows decent comedic value; it’s certainly funnier than almost everything in the final flick, so I wonder why it got cut. A few ads open the disc. We get clips for The Other Guys, Salt, The Karate Kid (2010), Easy A and Stomp the Yard: Homecoming. These also appear under Previews along with promos for Eat Pray Love, Beastly, Big Daddy, Mr. Deeds, Click, and 50 First Dates. No trailer for Grown Ups appears here. I didn’t think a film that starred talents like Adam Sandler, Chris Rock, Kevin James and David Spade could be mediocre, and I was right. Grown Ups isn’t average – it’s thoroughly awful. The Blu-ray provides very good picture, acceptable audio and a few moderately interesting supplements. The Blu-ray brings home the movie in positive manner, but the flick remains a real dud.